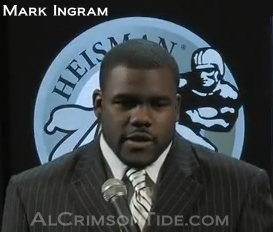 Heisman Trophy award winning running back Mark Ingram will miss the University of Alabama’s season-opening game against San Jose State this Saturday after undergoing arthroscopic surgery on his left knee. After that game, it will evaluated on a week to week basis on whenever he can return. “It was a situation where everyone involved thought it would be better to take care of now, so he would not have any issues with it later in the season,” Saban said. The good news in all this is that Alabama is plenty stocked up in the running back position with players like Trent Richardson & Eddie Lacy. I just hope Mark can come back by the Penn State if he can. He is a hoss and Bama is much better with him in the rotation. Best prayers @ hopes on a speedy recovery for you,RTR !!! Thoughts and prayers your way for a quick recovery! Roll Tide!!! Keep your chin up Mark. We, The BAMA NATION, are behind you 100%. Rehab well and return healthy ready roll. I’ll be looking forward to seeing #22 lined up in that Crimson Tide backfield ready to bust heads and score touchdowns. We’ll miss seeing you play Saturday, but I’m glad you’re taking care of your knee. Coach Saban is to be commended for looking out for your best interests, as well as the team’s. I’m a fan of yours as much because of your humble, down-to-earth attitude as for your playing ability. I wish you the best of luck for the coming years at Bama, please don’t rush your recovery from surgery, the team will be all right,the most important thing is your health. I just want to thank Mark for all of his contributions to the team so far and wish him well on recovering from knee surgery. I hope this will help you become even stronger and faster. We sure do care about you and your future! You are certainly our shining star! We wish you a speedy and full recovery!! !We are behind you and we know you will be back when it’s best for you. We will miss you but will loook forward to your return in the 2010 season. Take one day at a time and take care of yourself. God bless you. Roll Tide! Mark, if good wishes and healthy hopes count for anything you’ll be back busting butts this time next week. I just want to take this opportunity to wish you a speedy recovery. I will keep you in my thoughts and my prayers. You do not know what a thrill you gave us here in the great state of Alabama last year. We are so proud of you! Take your time coming back because we do not want you to permanently injure yourself. No matter what you are our “Son” . We wish you well in every endeavor in life. Once again…get well soon. Sorry about your knee, Mark!! Hope your healing process is swift and complete!! Roll Tide Roll!!! !Congratulations on your Heisman!!! Mark – So sorry about your injury. Best wishes for a speedy recovery. Take care of yourself and that knee. Roll Tide Roll! Praying for you & a speedy recovery! Roll Tide!!! Mark, we are so sorry to hear of your injury…take care of your health first…of course we will miss you. We look forward to your speedy recovery, and please always know YOU will forever hold a special place in BAMA fans hearts and in history too!! We will all truly miss you on Saturday, but we are all wishing you a full & speedy recovery!!! Can’t wait to see you back in the Crimson & White…..We are all so PROUD of you……You are surely someone to be admired for all your hard work & dedication,and it payed off, Mr. Heisman!!! You were very deserving of that great honor… Best Wishes to you in the future!!! Thanks again for being a major part of bringing BAMA football back to # 1 where it should be!!! ROLL TIDE!!! !